This one-of-a-kind necklace is truly special! It is a vintage gold-plated 4 picture locket that I topped with a prong-set Ethiopian opal (natural stone) cabochon on the top. 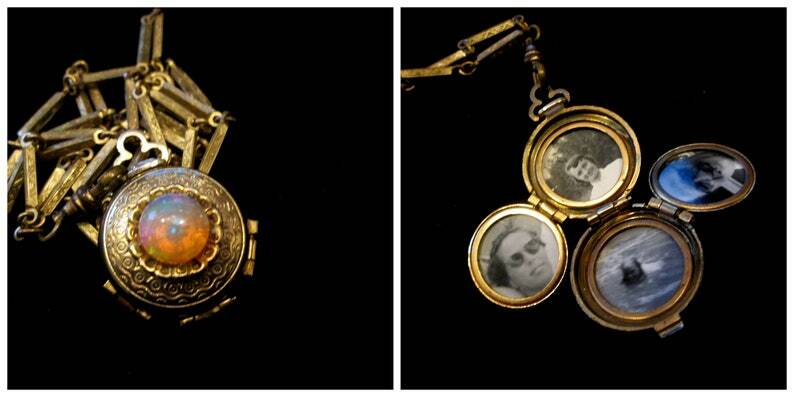 The locket opens to hold four photos under metal frames. The photos inside can easily be removed and replaced with your treasures. The locket is hanging on a vintage brass chain via a vintage gold-filled watch fob. The matte finish of the chain allows the locket to really shine. Please note that as these components are vintage, they do show slight signs of age. The chain measures approximately 24 inches. The locket hangs approximately 2 inches from the chain. The photo portion of the locket is approximately 3/4 inch in diameter.